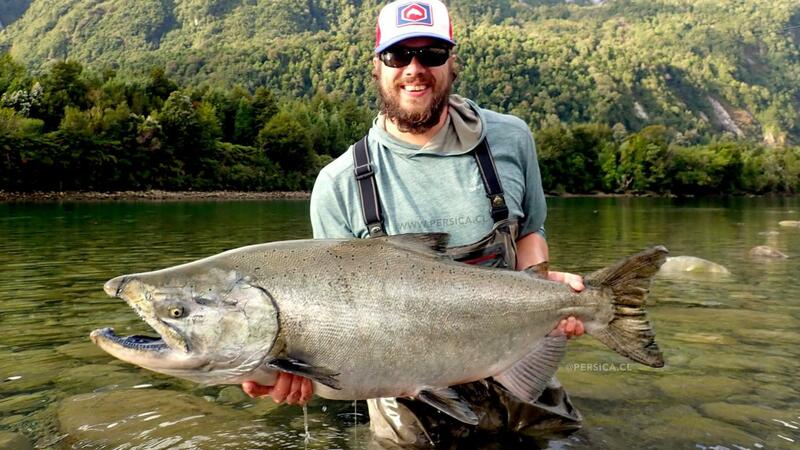 Persica es una empresa especializada en realizar tours de pesca, excursiones y exploraciones dentro de la Patagonia Chilena. Nuestros objetivos principales son: .- King Salmon (Chinook) .- Atlantic Salmon (Salar) .- Sea-Run Contamos con diferentes tipos de instalaciones, desde Cabañas hasta lujosos campamentos en cada uno de nuestros ríos. Nuestros servicios pueden ser básicos de guiados en bote o heli-fishing. Actualmente somos la empresa con mayor prestigio en exploraciones y pesca exitosa del gran salmón rey en la Patagonia Chilena. • Fly with us to exclusive places where no boat or fisherman could arrive • We can fly to the highest part of the river, even visit nearby rivers • We will pick the best option that week when it comes to Heli-Fishing • We have 3 different rivers to visit! “IF WE SEE SALMON FROM THE AIR, WE GO DOWN, FISH AND FLY AGAIN” PERSICA CAMP - LUXURY CANVAS TENTS: Absolutely waterproof tents with three top ventilation nozzles to prevent condensation. Windows and entrance door with mosquito net, guests will staying two double occupancy, each of our tents (5 meters in diameter) has two queen-size beds inside which include sheets, blankets and bedspreads. Single tented accommodation is also available! Ample interior space to easily store all your suitcases. Each tent of our guests has a 2.5M long awning with a large wooden hanger, this free space is designed to keep equipment or fishing clothes protected from the sun and rain. The interior and ￼￼￼￼￼￼￼￼￼exterior lighting of our tents and camp is obtained by solar energy. Each tent has a cell phone charger. Our camp has two equipped bathrooms (chemical toilet and sink with drinking water) We also have a shower cabin with hot water, adjustable up to 40º ￼￼￼(potable water) Our shower cabin has enough interior space to get dressed in dry clothes after showering, no need to leave it. Dining room with capacity for 08 people where our exquisite meals will be served, a meeting room to share a glass of wine and good times will always be available for our guests. At all ￼￼times we only use drinking water, thanks to our large water container. Our camp has a cell phone signal. OPTIONAL For all those guests who do not wish to use our Camp, we have a local house fully equipped with basic amenities. Single beds, bathroom, hot shower, dining room and heating. The Cabin is only available for full groups, since all our staff (cook, service and maintenance) must be moved, as well. ￼￼￼￼THERE ARE NO EXTRA CHARGES FOR THIS ALTERNATIVE ____ PROGRAM • DAY 1: Arrive in Santiago and then immediately depart for Puerto Montt where you will overnight at your elected accommodations ￼￼￼￼￼• DAY 2: Six hour transfer to the Chrome River (Persica Camp or Cabin) via private transfer service and boat. Upon arrival at camp a lunch !will be served, unpack and fish in nearby pools for the rest of the day • DAY 3-4: Two days of guided fishing in the Chrome River • DAY 5-6: Two days of guided Heli-fishing in the Chrome River • DAY 7-8: Two days of guided fishing in the Chrome River • DAY 9: Breakfast before beginning your six hour transfer back to Puerto Montt where you will overnight at your elected accommodations ￼￼• DAY 10: Depart Puerto Montt for Santiago where you will catch your return flight home. INCLUDES: .- FOUR DAYS OF GUIDED FISHING - TWO DAYS OF HELI-FISHING - SEVEN NIGHTS .- ALL PRIVATE TRANSFER FROM PUERTO MONTT TO CHROME RIVER (ROUND TRIP) .- LUXURY CANVAS TENT OR CABIN ACCOMMODATION, SINGLE BED, BATHROOM, HOT SHOWER .- ALL MEALS: BREAKFAST, LUNCH, DINNER .- NATIONAL BEERS & SELECTION OF CHILEAN WINES .- MAINTENANCE AND CLEANING SERVICE .- BOAT AND VEHICLE TRANSFERS .- TWO GUIDES AND TWO BOATS NOT INCLUDED: PLANE TICKETS - LODGING, MEALS AND TRANSFERS PRIOR OR AFTER FISHING PROGRAM - LAUNDRY SERVICE - HARD LIQUORS - FISHING LICENSE - GRATUITIES. 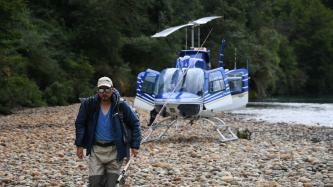 THE 02 DAYS OF HELI-FISHING WILL BE EXECUTED IN THE FOLLOWING WAY: First Day: After breakfast we start the flight to the upper part of the river, we can land on the river bank in the eventuality of observing salmon from the air. If the river conditions do not allow a clear observation, we will go directly to our first fishing spot. After the first stop wading fishing for 1 or 2 hours, after this we will fly again. In our second stop we will do wading fishing for the same period of time, after this we will return to the helicopter to fly back to the camp. After lunch we will fly again to the upper part of the river to 2 different fishing spots, the flight mechanics is the same as in the morning. 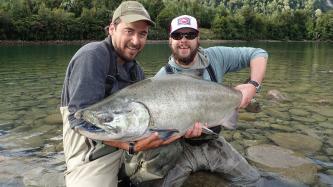 If we see salmon from the air, we go down, fish and fly again. If we can not see salmon from the air we will use our fishing spots. Second Day: Corresponds to the same mechanics of the first day, but we will always use different fishing spots or even visiting nearby rivers.- If the client wants to include more days of heli-fishing. these should always be consecutive. The payment of extra days of service may be added to the total amount or with a deadline of 30 days before the contracted week.- (ADDITIONAL DAY OF HELI-FISHING: $6,000 usd p/group) IMPORTANT; Reservations must be made with a minute of 45 days, before the selected date.